Aruba, is a small Dutch Caribbean island located a few miles north of Venezuela in the southern Caribbean. Aruba is famous for it’s white-sand beaches, temperate climate and because it’s located just below the hurricane belt, the climate is dry, and they have very little rain. Like most other Caribbean islands, Aruba is expensive. 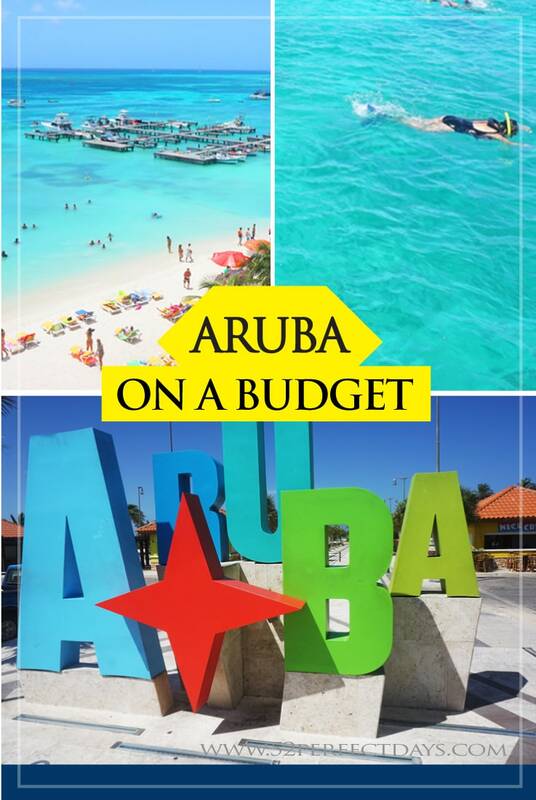 The good news is I have a few secrets to plan for an Aruba vacation on a budget. Planning a trip to Aruba? Aruba seems equally popular for couples and honeymooners as it does for families. You could pay a premium for hotels, food, and activities in Aruba. 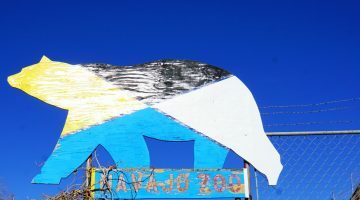 However, by eating local food, staying in cheaper hotels, and cutting a few other expenses, you can save money while you visit paradise and have an Aruba vacation on a budget. Here are 14 tips to vacation in Aruba on a budget. 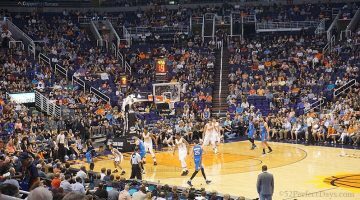 While the weather in Aruba is fairly consistent year-round, they do have an off-season. As you can imagine summer is the most expensive time to visit. My first Aruba travel tip is to visit Aruba after the summer season such as September or October. Even on Aruba, you’ll find budget hotels. 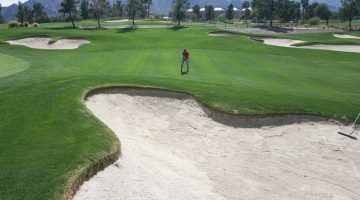 Dorado Eagle Beach Hotel, Sasaki Apartments, and the Coconut Inn all offer reasonable rates. Dorado Eagle Beach Hotel is located just a few blocks from Eagle Beach and just outside of the touristy Palm Beach areas. When I visited Aruba we paid $88 per night for our room. The hotel offers 10 rooms and is more like a studio apartment than a hotel room. The room has a kitchenette with refrigerator, sink, mircowave, coffee maker, as well as dishes, cooking utensils and silverware. This brings me to my next tip! Hotels like Dorado Eagle Beach Hotel or Tropicana Aruba Resort and Casino offer the convenience of a mini kitchen. Besides the cost of accommodations, food can be a major expense. I especially like to have breakfast in my hotel room. Just eating this one meal in the hotel room saves at least $10 per person each day. Bring your favorite snacks. 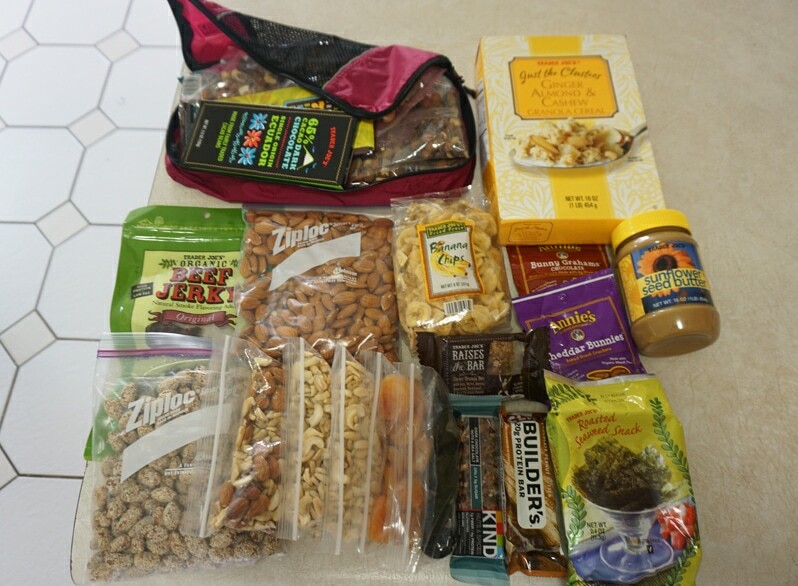 I bring granola or nut bars and beef jerky to carry in my backpack on daily excursions. I like to bring dried fruit and nuts which can also double for breakfast. I also bring a box of cereal and almond milk (if you aren’t doing carry on). I simply buy the box of almond milk and place it in a large Ziploc bag. I also like to bring chocolate and other sweet treats. Now that you’ve secured a hotel with a kitchenette, it’s time to go shopping. 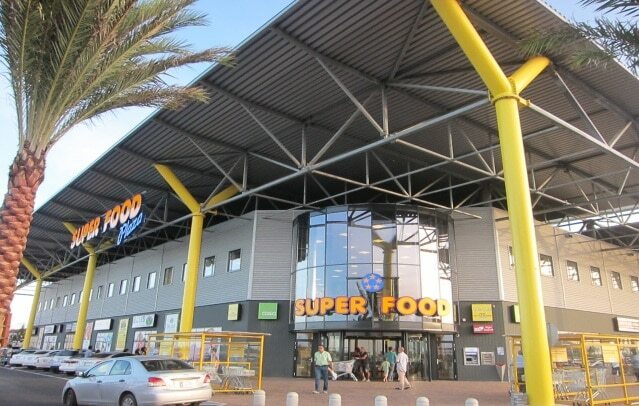 If you happen to stay at the Tropicana Aruba resort, there is a Super Food grocery store within walking distance. Otherwise, it’s well worth a taxi to head to the store and stock up for your Aruba vacation. This store has everything you could want and quite a nice deli. You can save a lot of money if you don’t eat out for every meal. Or for that matter, having the convenience of a refrigerator also allows you to bring home leftovers for a meal or snack. Bring a bottle of liquor or few bottles of wine or beer in your suitcase (if you check your luggage). There are some great Portable Wine Bottle Protector Sleeves that are great for travel. If you bring wine, don’t forget the wine opener. If you don’t bring the booze with you, you can find it at the Super Food grocery store. They have quite a good liquor store within the grocery store. All the big hotels have bars and waiter service at the beach. If you fancy a drink or two while you are relaxing at one of Aruba’s beautiful white sand beaches and you want to save a lot of money, bring your own cocktails. I saw people with coolers and picnics at many beaches. Do it like the locals and bring ice, a bottle of rum and Coke. It seemed to be the drink of choice for many beachgoers. Most budget hotels do not provide towels for the pool or beach. Bring a beach towel, or if you are tight on space there are a few great brands like Lightload and GO! 100% Organic Bamboo towel , that can be used several times and then tossed. The towels are compressed, so they take minimal packing space. Happy hour is a great way to save money on both food and drinks. Do a bit of research and find out who is offering the best happy hour deals during your visit. Instead of doing a group tour to see the island, rent a car for a day. You can rent a car starting at $40 per day. Tours run about $100 per person. Simple math will tell you that you are saving a lot of money with this Aruba travel tip. Every hotel I visited during our trip to Aruba provided fresh, cold water in the lobby. In fact, most hotels offered cold water infused with herbs or fruit. You can fill your water bottle with fresh water daily at your hotel instead of buying bottled water. Taxi’s are a simple way to navigate the island, but it does add up. Much of the tourist areas are within close proximity, so fares are fairly reasonable. Be aware they charge an extra $3.00 per direction on Sunday’s. Arubus N.V. is the major public transportation of Aruba. Arubus provides public transportation over major areas of the island. The main bus station is right across the street from the Cruise Terminal. The lines that can take you from Oranjestad to the beach and hotel areas are: Line 10, Line 10A, and Line 10B. A single bus trip costs 2.50 florins with your Smartcard or $2.50 U.S. dollars. Snorkeling is one of the best things to do on an Aruba vacation. You can certainly hop aboard one of they many snorkel cruises, but if you bring your snorkel gear, you can head to any beach on the island and find brightly colored coral, angel fish, clown fish, and even the occasional octopus. Note: Some hotels offer their guests free use of snorkeling equipment. Check in advance of your Aruba vacation to see if your hotel offers this service. 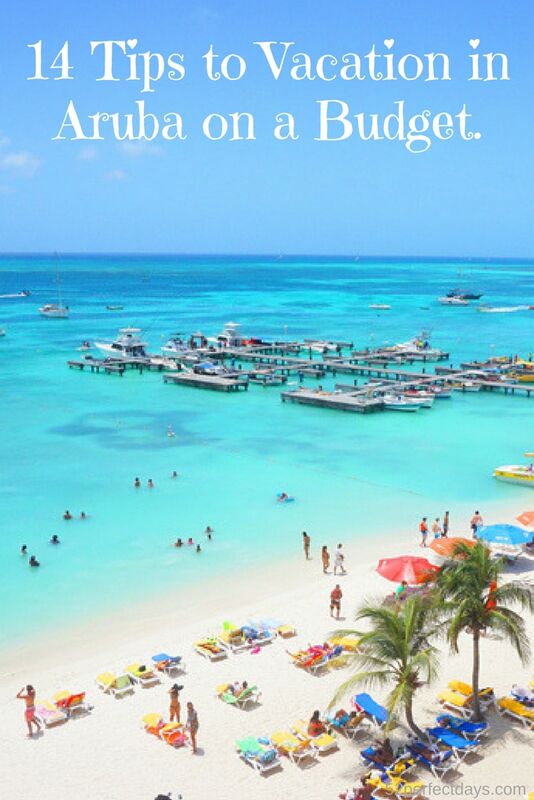 Those were my top 14 Aruba travel trips for a budget trip to paradise. What are your favorite tips for saving money when you travel? Please share in the comments below. The cheapest way to visit Aruba is from Florida or the East Coast of the United States. I live in San Diego, so getting to most Caribbean islands is a haul. Unless I want to drive to Los Angeles, I usually have a layover when flying from the West Coast to the Caribbean. As I said above, if you can incorporate a trip to Aruba during a visit to Florida you’ll find many direct flights. When I visited, we flew Jet Blue, with a layover in Fort Lauderdale. Jet Blue is one of my favorite budget airlines. 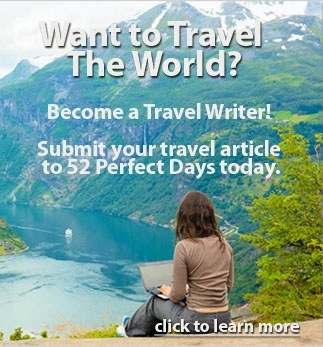 A great first step is to search for cheap flights by with Expedia. 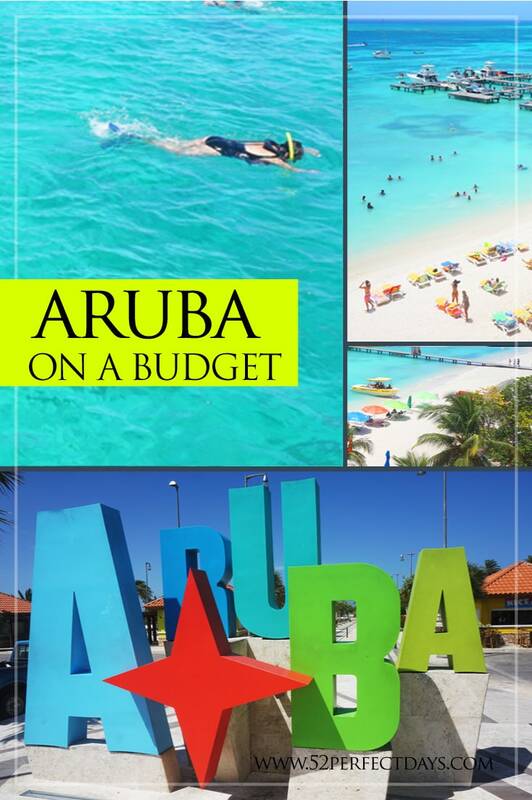 If you liked this article about an Aruba Vacation on a budget, you’ll love 52 Top Tips For Budget Travel. 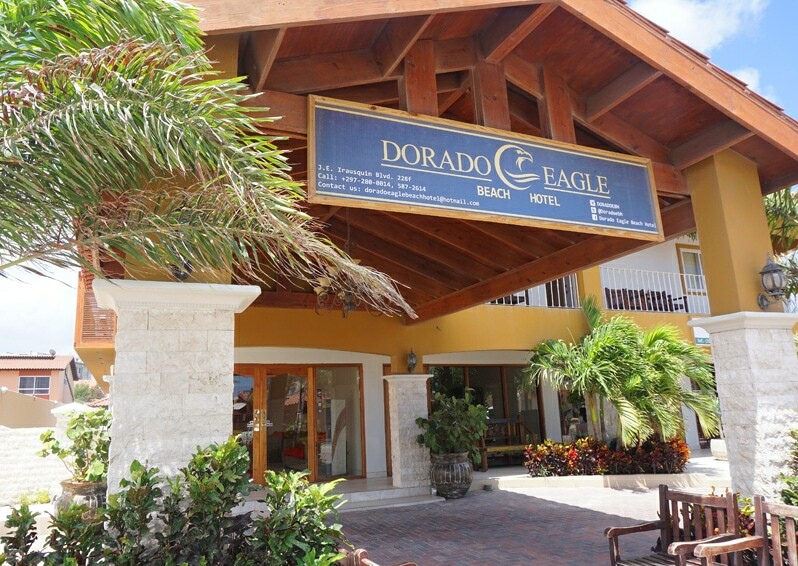 Dorado Eagle Beach Hotel – Run by a local family, the Dorado Eagle feels more like a motel than hotel. It has 10 rooms that are similar to a studio apartment. The room has a kitchenette with refrigerator, sink, mircowave, coffee maker, as well as dishes, cooking utensils and silverware. Major pluses were wifi in the room and it was only a two block walk to Eagle Beach. 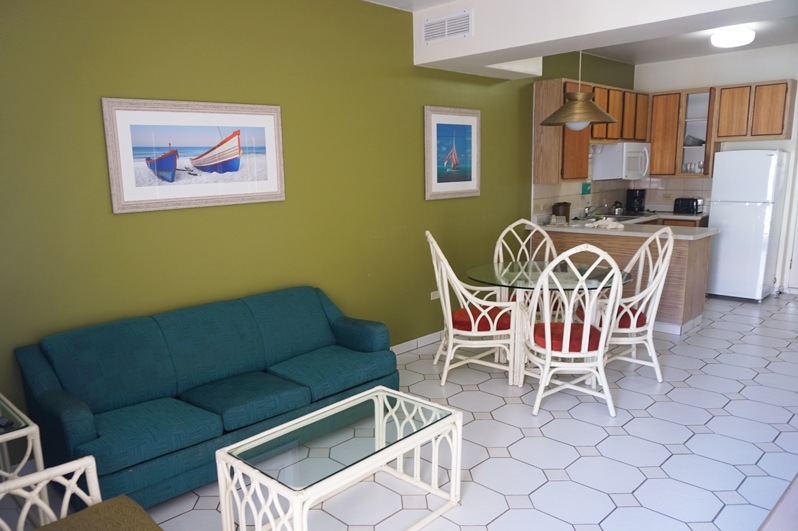 Cost: Rates will vary by season, but when I visited Aruba we paid $40 per night for our room. To check current rates, I suggest visiting Hotels.com or Booking.com. Tropicana Aruba Resort & Casino – Tropicana is more than a hotel but, not quite a resort. This a perfect if you are on a budget, but want a bit more than a basic hotel. The rooms are huge, in fact, they are more like suites. A one-bedroom also includes a kitchen and separate living area. Besides the size of the rooms, the huge feature they offer is their waterslide. It is the best on the island. To check current hotel rates for the Tropicana Aruba Resort, I suggest visiting Hotels.com or Booking.com. Hyatt Regency Aruba Resort & Casino – The 357-room property is located in Palm Beach and directly on the sand. The grounds are stunning with rivers, tiny waterfalls, geese swimming in a freshwater lagoon, parrots in ornate cages around the property. Not to mention several pools including a three-tier pool with waterfall, whirlpools tucked away in little alcoves and a great waterslide. Don’t forget travel insurance! I’m a fan of World Nomads for short-term trips. Protect yourself from possible injury & theft abroad. Read more about why you should always carry travel insurance here. Have any questions about Aruba? What about other suggestions? Leave me a message in the comments below! 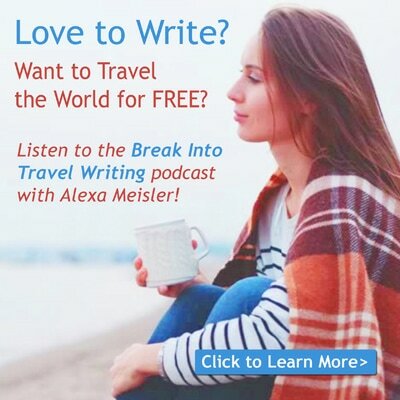 Alexa Meisler is the editorial director of 52 Perfect Days. Born in Paris, France she has since lived in Chicago, San Francisco, Los Angeles and Portland, Oregon. She currently resides in San Diego with her husband and son where they enjoy exploring California and Mexico. Travel has always been a part of her life; traveling to such places as Morocco, Tangiers and Spain as a young child as well as taking many road trips to Mexico with her grandparents as a young girl. Since then, she has traveled abroad to locations such as Russia, Taiwan and throughout Europe. Prior to working at 52 Perfect Days she was a freelance travel writer; focusing on family and women’s adventure experiences. Thanks Aaron! Hope you do visit! Beaches don’t get much prettier than in Aruba. Completely agree with shopping at local grocery store. I personally do it a lot and it’s definitely one of the best way to experience new culture. And plus, that normally saves me plenty of money. Yes. Such a fun way to learn about culture and find new foods to try. These are great tips! Really like the idea of bringing your own ice to cool down your drinks. I might go to Aruba as lately I heard a lot of good things about the place. Hope you have the chance to visit! Aruba is beautiful. 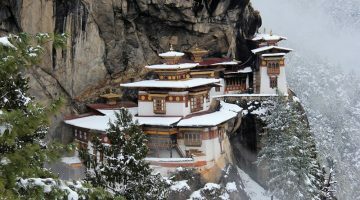 I hope I can visit it someday. I hope you visit too! Sheena, hope it inspires you to visit! Aruba is beautiful and it surprised me how reasonable I could make the trip. You can definitely afford Aruba on a budget. I’ve been the past four years & I leave next week for trip number five. I stay in AirBnB’s on the island, buy groceries, and limit eating out to once a day- usually dinner with friends who live on the island. Definitely plan your trip for late August through October when it’s low season. Also, ask the locals for recommendations for good local places to eat. They won’t steer you wrong either. Some of the best food is at little roadside stands or hole in the wall places. I spend most of my time on the beach, just relaxing which only costs me gas money & food/drinks I bring from the groceries I buy. Most AirBnB’s will provide a cooler for you to use. Just buy a bag of ice, which you can usually refreeze at the end of the day & use multiple times. Enjoy the one happy island! You’ll fall in love with the people, the island, and the laid back vibe of the island. I love these ideas and the great thing is they can be used almost anywhere not just Aruba. Thanks for the tips and I’m checking out the towels. We usually end up buying towels there and then taking them home. Towels take up so much room. The one’s I suggested are so small and useful cause they are bio-degradable too. Great tips, especially the budget hotel. When I visit a place like this I rarely spend much time in the room, so why spend a fortune? The snack ideas is another good one. Thanks Bob! Appreciate the comment. I agree about the hotel. I rarely spend much time, unless I’m at a resort. It’s a great way to stick to a budget. Wow Alexa, looks like a great place to spend your summer holidays. very good post with useful tips. During my Europe travel, we used to do the same thing, great way to manage your budget. I’m heading to Ireland and Iceland in a few weeks. Would love some of your European budgeting tips! We tried to take the bus once in Aruba and we missed the hourly bus by seconds! Such a bummer. Hitting up happy hour definitely saved us some cash though! I didn’t do buses when I visited, but that would be a great way to save money. The fact that most buses didn’t have a ‘bus stop’ worried me. We did a few taxi’s, but would probably Uber next time I visit. Alexa, if you cut out 7 & 8 (booze) altogether, you really save money, lol. A well-known NYC tour guide once said: “to learn another culture, shop at their stores.” With that said, I usually don’t bring much food. Btw, “No Rain” is a Blind Melon song! Hey Brian, Well #7 & #8 aren’t usually cut from my budget entirely, but good point! I agree about shopping locally — but depending on the location that can be spendy too. Aruba, though was reasonable. Oh and thanks for the Blind Melon trivia! Aruba looks like a perfect place to get away and relax. It has the Caribbean atmosphere about it. The fact that Aruba can be done on a budget is great news. Great tips and pointers towards this end. Thanks Sandy. I didn’t realize how cheap I could make Aruba until I went. It truly can be a reasonable vacation. 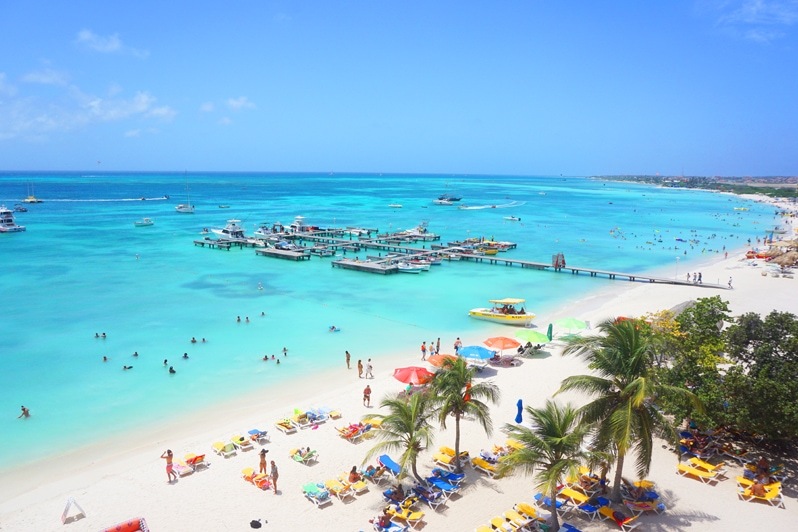 Great tips for saving money in Aruba and on vacation in general! I always prefer to stay at a hotel with a kitchenette. Although I don’t usualy cook, I like to shop at local supermarkets plus I pack snacks and energy bars from home. Great tips for saving money in Aruba and on vacation in general! I always prefer to stay at a hotel with a kitchenette. Although I don’t usually cook, I like to shop at local supermarkets plus I pack snacks and energy bars from home. Hi Patti. I don’t usually cook either, but love have the kitchen for an easy breakfast and saving leftovers. Also, nice to make sandwiches or something simple for lunch. These are great tips! I love the idea of byo drinks on the beach. I know! I can’t take credit for it. It was the locals I saw doing this. So smart! Great tips. 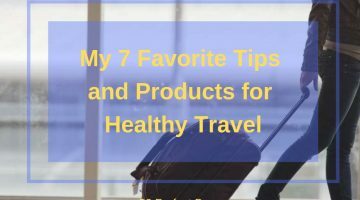 I liked the food you packed – I’m a big chocolate and nuts fan too 🙂 And yes, taking one’s favorite snacks saves a lot of money on a vacation. Thanks for sharing a useful post! Hi Antonina. Appreciate the comment. Love to know your favorite snacks when you travel. Great info! We are tracking to Aruba in July! At the Tropicana, do the rooms have a fridge? Also do they have pans, plates, utensils and such? Also they mentioned a washer and dryer in the room, is this right? Is it included or is it coin operated? Thanks In Advance! Hi Rachel! The Tropicana has a full sized fridge. They also have a microwave and stove. There were plates and utensils, but I honestly don’t remember if they had pans. Let me look at my photo bank to see if I took a photo of the inside of the cupboard. Our room did not have a washer and dryer but they were working on upgrading some rooms when I was there. I bet the new rooms might. Otherwise the washer and dryer must have been located in a dedicated room and I’m not sure if it was coin operated or not. Just got back from Aruba! It is by far the most beautiful and safe island that we have ever vacationed to, as a family! We ❤️ Aruba and will be back soon! I agree. It’s beautiful. Did you get to the other side of the island? Booze is very marked up in Aruba. (The locals tell me that is is due to high taxes on the island.) One way around this regardless of whether you checked a bag or not is buy duty free liquor in the airport they will allow a plane side check and it’s much less expensive. Great post. We recently took our family to Aruba on the cheap. I think you added a few tips that we might have missed. Hi! I loved your post – do you have links to the car rental that was so affordable? Thanks! I have read not to go to Aruba in September as it’s hot and no breezes then as all the lovely breezes are sucked out to the rest of the Caribbean for the hurricanes. You also find more mosquitoes at that time. I read that mid April to October is the cheaper “off season” time to go since most northerners like to go when they can escape winter at home, from December to March. Would you recommend bringing your bicycle? With all the Dutch influence there, I was hoping bringing or renting was a good option for transportation on the island. If not, with car rentals, are there any strange rules if the road or traffic issues to be aware of? Thanks for the write up! I’m glad to look beyond the big resorts and see other’s takes on the “explore” mindset! For some people it is very expensive or complicated to go to Aruba, but I tell them it’s really worth it! If you go there I recommend you stay at Azure Beach Residences (www.azure-aruba.com), it’s a beautiful place, something expensive, but it will make your vacations unforgettable!